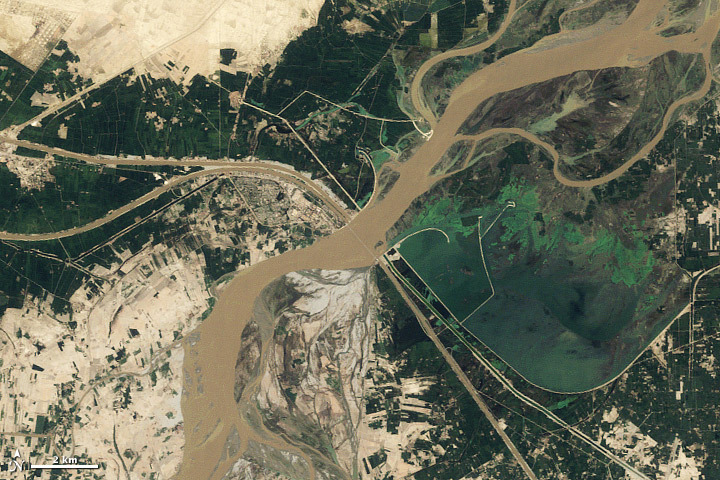 Seasonal changes along the Indus River. Credit: NASA image by Robert Simmon and Jesse Allen, based on Landsat 5 data from the USGS Global Visualization Viewer. Article 7.1. of the Paris Agreement established a new – and unprecedented – global goal on adaptation. However, mitigation remains the main focus in international debates and analysis on climate change governance. Here, the authors argue that the critical importance of adaptation is still under-valued in international negotiations. Specifically, the view that adaptation is a local problem is holding back ambition to pursue a global adaptation agenda that seeks solutions beyond the local-to-national level. It is important to recognise that, although Parties have agreed to limit warming to “well below” 2°C, the nationally determined contributions (NDCs) that have been submitted would result in warming closer to 3°C. Even this may be optimistic, as the 3°C estimate presumes that countries achieve their targets, which few are on track to do. With this reality as a backdrop, it is imperative to increase adaptation action worldwide. In this brief, the authors argue that adopting a transboundary view of climate risk, which explicitly recognises the interconnections between people, ecosystems and economies in a globalised world, changes the scope and nature of the adaptation challenge, and creates opportunities to reinvigorate international cooperation on adaptation. Specifically, the UNFCCC remains a critical space for coordinating global action on climate change, including building resilience and adapting to the adverse effects of a warmer world. The authors review recent progress in the international climate negotiations in order to set up a discussion in the second half of the brief about how progress in meeting the global challenge of adaptation might be achieved. A summary of the key points from the brief can be found below. See the full text (download from the right-hand column) for much mroe detail. The Party-driven nature of the UNFCCC and the design of the Paris Agreement means adaptation is mainly envisioned through a national-scale lens, while climate risks are shared across borders. This transboundary dimension needs to be better understood in order to ensure that international cooperation works towards achieving the global goal on adaptation. Climate impacts in one country will create risks and opportunities – and therefore may require adaptation – in other countries, due to cross-border connectivity within regions and globally. For the same reasons, adaptation measures taken in one part of the world have the potential to alter and affect cross-border links and flows, and therefore can have positive and/or negative effects in other places. Climate change impacts cross national borders via at least four climate risk pathways. Transboundary climate risk will affect both rich and poor countries, suggesting that it should be negotiated in inclusive international forums such as the UNFCCC, as well as other UN conventions. It is also important to consider the role of adaptation in reducing – rather than redistributing – vulnerability globally. Develop a shared language for transboundary climate risk. Currently, a diverse terminology is used to describe this phenomenon. But in order to clarify what is at stake and to delineate the scope and potential for meeting the global adaptation challenge, Parties – as well as researchers and practitioners – need a shared language to describe those aspects of climate impacts, risk and adaptation that extend beyond the local and national scale. Include a transboundary framing of climate risk in adaptation negotiations within the Ad-hoc Working Group on the Paris Agreement (APA) and the Conference of the Parties (COP). Beyond the UNFCCC, there is a need to share responsibility and work together, through a community of practice that convenes relevant actors from within and beyond the UNFCCC process, including other relevant UN Conventions (such as the UN Convention to Combat Desertification) and non-state actors. Promote improved, fairer and more equitable regional and global governance. Successfully adapting to both local and transboundary climate risks – and thus meeting the global challenge of adaptation – requires more than money. Chnages in governance may offer one of the most efficient ways to reduce and manage transboundary climate risk and therefore support adaptation globally. highlight exposure to transboundary climate risk that, if not addressed, will introduce risk into global systems and potentially redistribute vulnerability rather than reduce it. The global stocktake must do more than aggregate national contributions. The authors propose adding an additional flow of data and synthesis to those identified in the UNEP Adaptation Gap Report, which would track and assess transboundary climate risks and regional or global adaptation responses. The Adaptation Committee could convene a work programme on transboundary climate risks and adaptation responses, facilitate the sharing of best practices, and initiate discussions on how to identify and address the range of transboundary risks. The technical examination process on adaptation (TEP-A) could focus its technical examination meetings in 2020 on transboundary adaptation – or, more broadly, on global adaptation, which necessarily includes transboundary adaptation. Least Developed Countries Expert Group (LEG): The technical guidelines for NAPs prepared by the LEG includes coherence at the regional level as part of its implementation strategy, but these guidelines could go further. Countries should also be provided with guidance on the transboundary dimensions of adaptation. Non-Party and non-state actors, including private actors and regional and international organisations, could better align their efforts with those of Parties, in order to collectively avoid vulnerability redistributions and support adaptation to transboundary risks. This could include increased attention to transboundary climate risks under the Marrakech Partnership, including in the reporting within the Yearbook of Global Climate Action. Donors and climate finance institutions should ensure adequate finance for addressing both local and transboundary climate risks and should design specific mechanisms to address systemic global risks in addition to local risks. The inclusion of transboundary climate risk in the adaptation mandate should not crowd out commitments and calls for funding adaptation to local risks that result from direct climate impacts; these are highly urgent in many places. Instead, the authors recommend donors and institutions review their portfolios and funding programmes to identify whether they are mainstreaming transboundary climate risks in a way that provides co-benefits to local adaptation. Parties and stakeholders to other Conventions, as well as other relevant international governance initiatives and international law in general, should consider the extent to which existing norms and legal frameworks can be used to facilitate global adaptation to transboundary climate risks. Transboundary climate risks are already detectable around the globe, demonstrating a clear need for mechanisms to address them at the international level. This discussion brief was written by Magnus Benzie, Kevin M. Adams, Erin Roberts, Alexandre K. Magnan, Åsa Persson, Rebecca Nadin, Richard J.T. Klein, Katy Harris, Sébastien Treyer and Amy Kirbyshire. It is the result of a joint collaboration between the Stockholm Environment Institute (SEI), the Overseas Development Institute (ODI), and the Institute for Sustainable Development and International Relations (IDDRI). ODI is a leading independent think tank on international development and humanitarian issues, and IDDRI is an independent research institute dedicated to fostering the transition to sustainable development and prosperity for all. Read "Transnational climate change impacts: An entry point to enhanced global cooperation on adaptation?" Read "Is adaptation reducing vulnerability or redistributing it?"